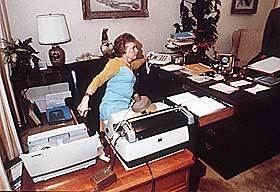 CBS will reveal that the typist of the Killian Memos is none other than Rose Mary Woods, a limber and versatile member of the Nixon White House. Here she demonstrates how it only took her 18 minutes to type them. "It was easy to do after I discovered that by pushing the foot pedal on the Dictaphone while answering the phone, I could do those superscript things". Major Pain is enroute from Ft. Hood to her new posting at Ft. Drum in Upper New York State. I keep telling her how pretty it is there, but she keeps saying she's going to miss Texas. And she's looking for a snow blowing attachment for her riding mower. Republicans point to others and say "We're better than they are". Democrats point to themselves and say "We're better than they are".